The stunning, tall beautiful damsel, April Love Geary has been in the modeling world for over a decade. She is currently signed to two renowned agencies in the world and is commonly known as the girlfriend of the popular music artist, record producer, and songwriter, Robin Thicke. April has tried within her capacity to live a very quiet life, however, her relationship with Robin has made that nearly impossible. Here are lesser known facts about the trailblazing fashionista. April Love Geary was born on the 6th day of the month of Christmas, in the year 1994. She is an American of mixed ethnicity – Mexican, Irish, Dutch and French descent. Her educational details are not on records, however, we know she completed her fundamental education in California and was also an A student. April is full of life and started building her career as a model at the tender age of twelve. She is currently signed to IMG Worldwide and Photogenic Talent agencies. Her most outstanding shots as a model are those she made on bikini and killer heels; they seem to be her trademark. April was featured on Sports Illustrated and has appeared on several online shopping sites especially for Tom Ford’s Fragrance. April lived a quite live as a model but her status quo rose when she started dating renowned music artist Robin Thicke. Their relationship hit the world with a bang as the age difference between the duo is quite alarming but as they say, Age is just a number and Love is no respecter of age either. Robin Thicke found love with April Love Geary as he was finalizing his divorce with his ex-wife Paula Patton who he married in 2005. Surprisingly, Paula was two years older than Robin but like the case of April, age was just a number. They were married for ten years before finalizing their divorce on March 20, 2015. The duo has a son named Julian. 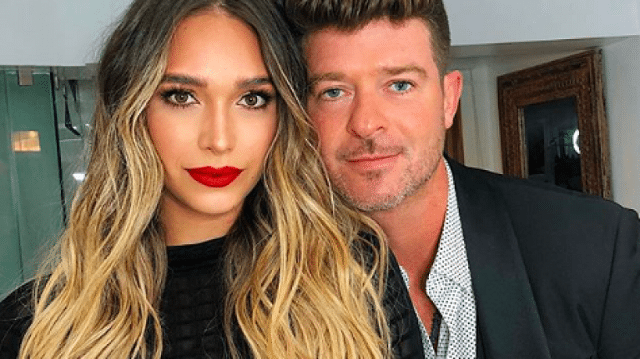 April Love Geary met Robin Thicke sometime in 2014 and has been flaunting their relationship without listening to the negative uproar on social media. While we were trying to understand if the relationship was a rebound, the duo hit us with another surprise and welcomed their first daughter in February 2018 named Mia Love. Mia is also expecting a sister soon as the model has announced that they are expecting their second child – a baby girl. As for whether the two are going to walk down the aisle soon, we can’t tell as we believe the excitement of their children may put a pause on their marriage plans if there was any. April Love Geary has played the perfect role of being a stepmom to Julian Thicke, Robin’s son with Paula. Apparently, they didn’t have issues blending as she has posted different pictures of them together on social media and also pictures of their recent trip to St. Barts. It may not look like but right now, but you’ll be shocked to know that the stunning model was once a tomboy and she has a flair for traveling as she has been touring the world both on planes and ships. April keeps a bearded dragon as a pet; isn’t this weird?. She is currently worth $1 million. April was born to Diana and Patrick Geary but she seems to be estranged from her dad as there is virtually no info about him anywhere. However, she has a very close relationship with her mom and doesn’t fail to express her profound love for her on social media, often showing off the numerous gifts she comes bearing every mother’s day. April Love Geary is the youngest of three siblings, however, the other two; Monica and Olive are her half-sisters. We can’t tell if they were children from her mom or dad as she has also hidden these facts from the spotlight. We wouldn’t know the reasons why the young damsel has withheld pieces of information about her immediate family but we know for sure that she loves them without doubts. They grew up at Huntington Beach in California. With a beautiful skinny body, you could vouch for April Love Geary’s frame as one of the most perfectly created being on planet earth. The damsel is quite tall and has very long legs. She stands 5 feet 11 inches tall, weighs 57kg, has full lips, a full bust, and her bunny bums. She naturally has brown hair but loves to try out other colors especially blond highlights. She measures 34-33-23 for her bust, hips and waist size respectively.